I had one of those days this week when everything seemed really difficult and I felt like nothing I was doing was working. It triggered all my self-doubts and my confidence was on the floor. But this up and down flow of confidence is completely normal. The thoughts we have in certain situations and with certain people can make us feel really confident or reduce us to self-doub. Ask yourself “When did I feel like this before and what happened?” Recall the last time you felt unconfident, did you still take action? Did the self-doubt feelings go away? When you’re feeling in a positive place it’s worth recording successes you’ve achieved despite doubting yourself. These are really helpful to read when you hit that dip again. Challenge your expectations. If you expect to achieve very high standards all the time you are setting yourself up to fail as no one is perfect and that can really knock your confidence. Challenge the goals or expectations you have, are they realistic and challenging without being perfection? Who are you comparing yourself to? The most common people we compare ourselves to are siblings, Facebook friends, colleagues and people we watch or read about online. But you’re only comparing the window dressing of these people with the whole of you. Instead keep your focus on you and your goals because life is scary and messy for everyone at times. Feeling unconfident is helpful. Emotions are the bodies way of telling us what our thinking is at that moment. Low confidence is just telling us that we’re about to do something new, difficult or both. It doesn’t mean we have to stop but that we should think carefully about how we do it. Next time you feel your confidence levels drop try out these tips. Not all of them will be helpful to you but do find your favourite and give it a go. If you find your self-doubts are holding you back then do book a free consultation with me at www.speakwithjo.com. 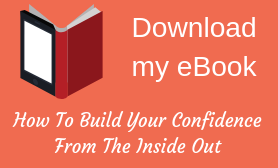 I’ll share with you some strategies to help you boost your confidence and move forward.